I recently read the the classic social history, Streetcar Suburbs by Sam Bass Warner, which analyzes the transportation, financial, architectural, and social trends that created streetcar suburbs, with close attention to three neighborhoods outside of downtown Boston – Roxbury, West Roxbury, and Dorchester. The book covers how these places developed with fantastic and fascinating attention to detail, but provides unreliable explanations as to why. The economic driver of suburban expansion was the rapid growth of a middle class including upwardly mobile Irish, Italian, Jewish and other immigrant groups. 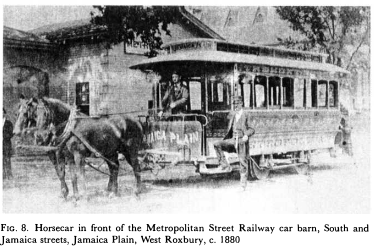 The emergence of horse-drawn railcars after 1850 enabled practical commutes to expand from a two-mile walking distance up to four miles from the city center. Electrification starting in the late 1880s enabled streetcars to run twice as fast and carry three times the number of passengers, extending the commute radius out 6 miles from the city center, supporting population growth in metro Boston from two hundred thousand to over a million residents. In a pattern that has been revived in recent decades, much of the streetcar development was fueled by real estate speculation. Henry Whitney extended the West End line to Brookline to promote new residential development on Beacon Street, and similarly, Dorchester’s streetcar lines funded by speculators in Dorchester real estate. My favorite tidbit about the relationships between transportation infrastructure and social structure is that central middle class workers – store-owners, lawyers, prosperous salesmen and contractors – had jobs in the center of town, so their commuting needs were met by linear streetcar lines with frequent service (10 minutes or less) that radiated out from downtown Boston. But the lower middle class included building trademen who worked at different sites around the city, and skilled craftsmen such as piano makers, printers, and furniture makers who worked at different shops depending on workload. So linear extensions of streetcar lines were not enough not meet their needs; artisans preferred housing in locations served by infill crosstown lines that allowed them to get to work sites without heading all the way downtown and back out again. Meanwhile, upper middle class workers preferred homes on larger parcels, often in further out neighborhoods, up to 10 or 15 miles from the city center, connected by faster heavy rail. The book’s characterization of workers as male is deliberate. The book defines a middle class lifestyle as the ability to support a family on one income (assumed to be the husband’s). In the families of the lower middle class artisans were there women who worked outside the home? Possibly, but the book assumes all commuters are men. Also, the book describes the neighborhood layout exclusively in terms of the needs of male commuters; if the needs of women managers of households came into play in home design and the layout of retail areas, the book is silent on that topic. The streetcar suburban neighborhoods were built with highly uniform design, even though they were developed by many individual builders. Unlike earlier major development initiatives in Beacon Hill, the Back Bay and South End, which were built by big syndicates with the ability to raise the capital to raze hills and fill marshes, the development of 22,000 residential buildings in the three streetcar suburbs covered in the book was conducted by 9,000 independent small developers. Because small developers were taking high relative risks for their budgets, they tended to make conservative decisions to create housing that would most easily find buyers. Although the descriptions of how the streetcar suburbs grew are robust and compelling, the reasons why they grew the way they did are less persuasive. Warner documents that the creation of suburb and the attraction of suburban life was motivated by ideals of country living. 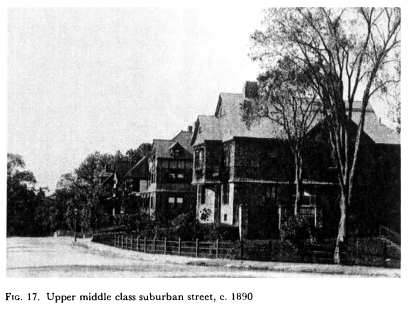 Increasingly prosperous middle class residents flocked to new suburban neighborhoods in flight away from the dark, cramped, unhealthy confines of tenement living, believing that that a more rural setting, emulating the country housing of English gentry, with green space, light, and air would be better for happiness, health and wholesome morals. A theme of the book is that economic segregation evolved on its own, through the bottom-up preferences of people choosing to live near others in similar economic circumstances, well before explicit zoning baked these divisions into local land use ordinances about lot size, setbacks, and residential density. And yet, what strikes a reader familiar with neighborhoods shaped by decades of zoning is the level of diversity that emerged in the early streetcar suburbs, where single family homes, duplexes, triplexes, and small apartments might be intermixed on a block and in a neighborhood. The three towns covered by the book added 22,500 residential buildings, including 12,000 single family homes, 6,000 two-family, 4,000 3-family, and 500 larger units, housing 167,000 people. Only half of the housing units were single family, and different housing types were not infrequently adjacent to each other, quite different from pattern set by 20th century zoning, in which single family homes are carefully separated from multi-family dwellings. Warner explains that the streetcar suburban neighborhood layout, with all of the housing facing the street edges, was a result of buyer preferences for the prestige of a streetfront location, and aversion to more alley entrances which allowed for both smaller and larger homes. That explanation comes across as tautological, given the persistence of alley housing in Chicago, Philadelphia, Vancouver, and other cities. Describing the housing types in Boston’s streetcar suburbs as the inevitable result of status preference begs the question of why alley housing was beneath the dignity of Boston area residents and acceptable elsewhere. 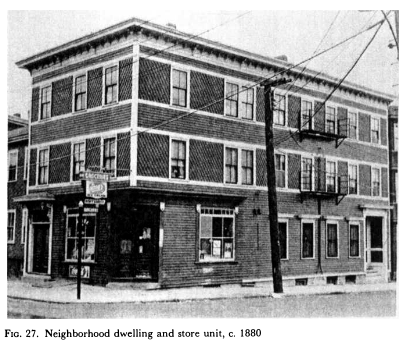 In the streetcar suburbs portrayed in the book, neighborhoods were developed incrementally, and as neighborhoods filled in, the remaining smaller and odd-sized parcels were often developed with more modest and multi-family homes. The advent of smaller-unit housing types in a neighborhood is portrayed as the first sign of an inevitable decline. Warner asserts, without persuasive evidence, that the smaller housing types accelerated decline since they were immune to being upgraded, unlike larger homes that are easier to rehab and subdivide. This assumption would come as a surprise to waves of gentrifiers who have been rehabilitating streetcar-era older homes, including small houses, duplexes and triples, for decades now. While the book gives careful attention to the emerging forms of mortgage financing which allowed a growing number of middle class buyers to afford homes, it gives no consideration to the availability (or lack) of financing to upgrade older properties. Mortgages during the streetcar suburb era covered in the book were dominated by small private investors, were issued in relative short terms from one to ten years; were often renewed several times, and didn’t yet allow the borrower to be paying down principal along with interest from the start. This financial structure enabled about a quarter of the population to own homes, but entailed substantial risks for buyer and lender, issues that were later alleviated with government-protected 30 year amortizing mortgages. Warner takes for granted that housing stock would would “decline” with age as styles fell out of fashion, and describes presence of mixed housing types as a factor that accelerated decline. However, as reported by the later classic on the growth of US suburbs Crabgrass Frontier, US government financial policy deliberately restricted financing to rehabilitate older homes. In the 20th century, neighborhoods occupied by African-American and other perceived undesirable ethnic groups were subject to “redlining.” In redlined areas, mainstream mortgages became unavailable, and so it was nearly impossible to purchase existing homes with a financial model conducive to maintaining the buildings in good condition. In the second edition published in 1978, Warner mentions that some of the neighborhoods of Roxbury and Dorchester had become occupied by African-Americans as part of the ethnic succession, and also that some areas had become delapidated slums. Without mention of redlining, Warner’s explanation that neighborhoods were set on a path of inevitable decline by the advent of excessively urban and diverse housing types is not persuasive. Supporting the narrative of the inevitable decline of streetcar suburb neighborhoods, Warner takes for granted that people who have choices about where to live would prefer brand new, larger homes, in land opened up for development by transportation improvements, including, after the time period covered in the book – automobiles and highways. 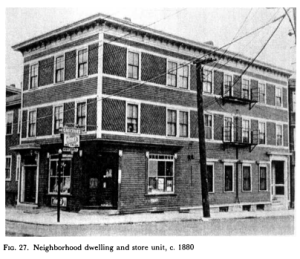 “Successive transportation changes have made possible the shifting of fashions in middle class house lots from the first doubling of the walking city’s row-house lots, to the parcels of 3,000-6,000 square feet common in the streetcar suburbs, to the present fashion of quarter- to full-acre, and even larger, lots.” Inevitably, better off residents would leave when area became less fashionable, and move further away. Streetcar Suburbs was first published in 1962, and revised in 1978; in an era where US suburban expansion continued with no slowdown in sight. Warner does give some attention to the phenomenon that about half the population was left out of the housing improvements available to upwardly mobile middle class residents. The book talks briefly about several initiatives to provide charity housing with private funding. The author writes about how middle class residents came to fear urban neighborhoods as dens of crime, but does not consider how urban crime zones were actively created; through deliberate concentration of zones of extra-legal commercial activity. In the conclusion of the book, Warner points out some weaknesses associated with the trend toward suburbanization, but this explanation also comes across as a just-so story. Warner points out that the streetcar suburbs had were designed with commercial areas in strips along transit corridors, and clustered around intersection crossroads. The streetcar suburbs had many churches, synagogues, and ethnic community gathering places, but tended not to have physically coherent town centers. The lack of central public space, argues Warner, contributed to a deficit of social and civic cohesion, and therefore to fragmented governance and lack of ability to solve problems across the metropolitan region. A more compelling explanation for metropolitan dysfunction is the economic collapse that occurred once industry moved out of the central cities; and the more prosperous residents had already left. When cities had a strong tax base, emerging suburbs sought to be annexed to the larger city which could provide stronger city services. When the city’s tax base imploded, suburban jurisdictions figured they’d be better off independent, and had little motivation to work with other jurisdictions to solve regional problems. The preference for independence was bolstered by the trends toward economic segregation. More prosperous residents chose to live further away from lower-income residents, and to bake the patterns of segregation into laws. In the time window when Warner lived and wrote, it was common-sense to assume that neighborhoods went out of style and had most of their appeal “used up” after the first-generation that they were occupied, and people with choices would “naturally” move on. By affirming that the large-lot, garden-surrounded suburban estate is the ideal, and describing more compact housing types as a fall from the ideal, Warner misses an alternative interpretation of the form of the streetcar suburb. From today’s vantage point, streetcar suburbs seem (at least to some including this blogger) like an attractive, alternative urban form. The housing variations that Warner saw as bastardizations and signs of social unravelling can also be seen as welcome tools for healthy age and income diversity. 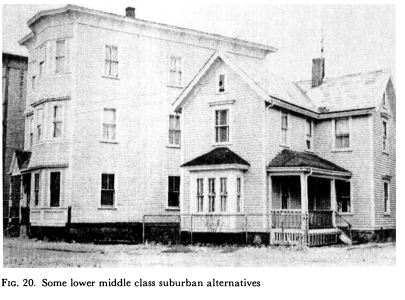 The changing of fashions, which Warner sees as inevitable decline, can be seen alternatively as “filtering” which allows older and currently less fashionable homes to be occupied by lower-income residents. With walkable, transit-rich neighborhoods coming back into favor, some core urban and streetcar suburb neighborhoods are now facing an opposite challenge – an influx of wealthier residents, and escalating prices that create displacement pressures on lower-income residents. From today’s perspective, we wonder why it’s impossible to build places like the old streetcar suburbs anymore, and see the zoning requirements that make these housing types illegal. In the value judgements underlying its analysis, Streetcar Suburbs sheds light on why those laws were put into place – the density and diversity of housing types that look attractive and socially healthy to today’s urbanists looked ugly and socially harmful to proponents of mid-20th century suburbs. With the benefit of hindsight, the narrative of the streetcar suburbs no longer appears like one phase of a march of progress toward the next suburban frontier, with better-off residents moving on once resources in a place are used up. That narrative left a lot out to begin with, on topics of class and race, investment and infrastructure. Now, as the attributes of streetcar suburbs are coming back into fashion – our society faces different challenges of how to evolve older neighborhoods in place. One big surprise I got from the book was that the streetcar suburbs were initially ethnically mixed (by which I think he may mean just Irish, Italian & Yankee) and only sorted out later. Of course, in this period the Italian and Jewish immigration was just starting — from another book I read a long time ago, Italians did not replace Irish even in the North End until the 1890s, and Patrick Kennedy, JFK’s grandfather, was still the ward boss there until after 1900. Also Jews. A hypothesis in the book is that the streetcar suburbs enabled ethnic mixing by means of economic stratification. People were ok living with other ethnicities as long as their neighbors were economically similar, which gave them comfort that their children would be in a morally safe environment (I can look up the quote). As noted in the blog post, I find the the research in the book to be robust and the interpretations dubious. Makes me want to go back and re-read Common Ground for Lukas’ information and perspective on neighborhoods and ethnicity.